FairCoin was initially distributed through a vast airdrop process during the 6th and 8th of March, 2014. An approximate 49,750 addresses were logged for the giveaway, each able to claim 1000 FAIR per hour. Automated airdrop claiming methods had no effect, as each IP address could register once per hour, and 2 different captchas had to be solved. These security precautions were hidden till the day of distribution. FairCoin's vast distribution method allowed a good portion of the cryptocurrency community to claim a little bit of the 50,000,000 FairCoins, each. The algorithm FairCoin was using from then until mid-2017 was a hybrid of “Proof of Work” (PoW) and “Proof of Stake” (PoS). PoS gave the chance stake FairCoins while holding in the wallet, with an interest rate of 6% in year 1, 3% in year 2 and 1,5% in year 3 after its creation. FairCoin was abandoned at the end of April 2014 by its original developer; but not after promising huge projects, private investors, and much more. The FairCoin community was left to sit with unfulfilled promises, high hopes diminished, and a moral completely drained. A few leaders in the remaining community organized a new development team, consisting of some of the most devoted members. Because the creator of the second ANN was not really involved, which was inefficient to have a good communication, we decided to close the second ANN at the same time of the First hard fork, and we created this third ANN, really accessible by the current FairCoin Development Team. September 8th: The people from the Coop together with people from other groups around the world are working hard from lasts weeks in a new broader cooperative that has been called Fair Coop. This coop will not accept fiat money and faircoin will be the only cryptocurrency accepted. To all the FairCoin fellows who had or have yet their FairCoins at Mintpal! We were talking with the Mintpal V1 team about how to redistribute the missing FairCoins, they don't have access to the Mintpal V2 system, but they have confirmed that Ryan doesn't control the FairCoins! Mintpal V1 is in control of the missing FairCoins and these are good news! So we are going to help the Mintpal V1 team by requesting additional information to help to quickly set up a working withdrawal procedure. lease fill in the form below to prepare a possible manual withdrawal. It is important to provide as accurate information as possible so we can correctly match it to your balance. Mintpal V1 has sent the wallet.dat and user/ balances info to the faircoin dev team! Today we will begin withdrawals with the already filled forms, will ask adress to the other users, and will begin proceding with the next steps to recover the faircoin normality! yet, lots of users pending of filling their form! 09/12/2014 IMPORTANT STATAMENT RELATED TO MINTPAL FAIRCOINS AND NEXT STEPS. - Introduction we waited until we have more information, to make this statement. With the possibility to give us time enough to study the better strategy, for solving the problems that we relate below, without increasing the possibility for an hypotetical scammer to make unrecoverable the coins or sell for bitcoins. Now we think that this possibilities are reduced enough to make it public and require the collaboration of the faircoin community. - how we have procedeed the withdrawal of mintpal coins. Smartaction had an account in mintpal of 9079874,833373 faircoin that belongs to a cooperative investment fund in benefit of different local projects. He decided to give the advantage to other holders to withdraw their coins first, and everyone had the oportunity to receive their coins and at least three weeks of time to do it. after deduct 40973,05805086 claimed by [Suspicious link removed] that we have frozen until confirm the balance of this multipool with faircoin users. After this, we need your help for finishing the analysis where the lost coins are, and confirm if we have data enough to recover it and if it makes sense to do it. At the technical level Thomas has done a development to make possible to recover lost coins without changing yet nothing of the blockchain, therefore all depends if we are secure enough about what needs to be done, and if the comunmunity support our plan. In fact, we have done already a lot of work this past weeks related blockchain analysis and we discovered that the first thesis that mintpal v1 told us does not makes sense enough. Therefore there is no proof that this coins are in the hands of Ryan/aleen green from moolah, at least not most of them. An important proof of this is there are not enough unidentified coins in adress younger than march 31 (data of mintpal beginning) to cover this 6.6 M coins. The most probably option is that Mintpal V1 suffered in the early days of faircoin in mintpal, (march 31 - april 8 ; when faircoin had unvoluntary hard forks) from a block chain fork, a bug or a hack. If this is true, they credited coins to the balance of users when they actually shouldn't have. Please PM smartaction if any of this addresses is yours and after you confirm your ownership we will update this list, and this will help us to finish our analysis. Please process your personal search as soon as possible in order we can advance to the next steps sooner. Otherwise if you detected in the past specially first days of Faircoin in Mintpal, any irregularity when you made deposits in Mintpal (like no transaction appeared in the good blockchain, but the balance was updated in your mintpal account), let us know. Yours Enric Duran (smartaction) and Thomas Konig (thokon00) Faircoin development team. The upcoming version of the FairCoin client software will be an important step for the Faircoin development!! It is much easier to port existing software that was written for Bitcoin to the FairCoin network. E.g. The Bitcoin wallet for android, the Electrum Bitcoin wallet, libbitcoin, etc. Much better performance! The scrypt hash algorithem that was used up until now is much slower compared to the SHA256 hash algorithm. The new block chain will contain a special block that recovers about 4,000,000 FAIR that were freely distributed at the start of FairCoin back in March 2014 and have never been used since then or are simply lost. This release contains some major changes to FairCoin. Our aim is to develop FairCoin further and prepare it for broad adoption. With the changes we've made to the code base the development of merchant applications, alternative FairCoin wallets and mobile applications now becomes easier and can be implemented faster. We have improved the performance of the FairCoin wallet significantly. The overall speed gain and still maintaining the same high level of block chain security is also a prerequisite to establish a reliable and stable monetary system for https://Fair.Coop. After you have downloaded the new release, please follow the guide below. 1. Make a copy of your wallet.dat file and store it at a safe place! Write down the FAIR balance that is displayed in your old wallet. If you haven't done yet make a copy of your wallet.dat file and store it at a safe place! If you missed step one and two, make a copy of you wallet.dat file and store it at a safe place! Start the new wallet and let it download the new block chain. This takes about 10 to 30 minutes depending on your internet connection and your computers performance. (Your balance will NOT be displayed yet, so don't worry!) Also, you should not create a FairCoin.conf file, it is not needed. 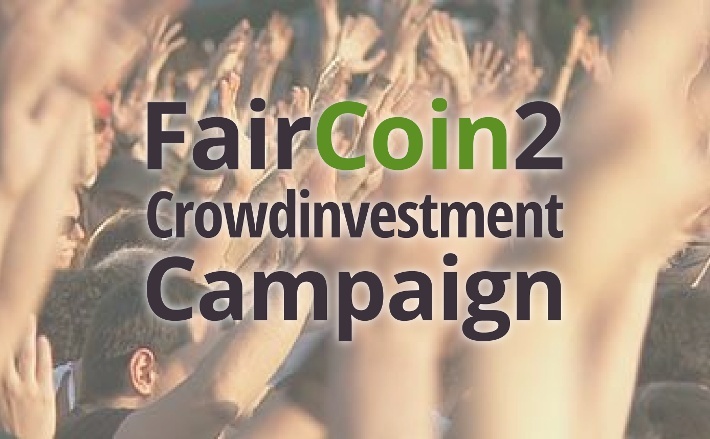 If you still have any questions or need support please contact our forum thread here or contact us directly at support@fair-coin.org. The faircoin dev team is already working hard with FairCoin 2.0. A more definitive whitepaper will be launched on march and after that the focus will be in the programming and extend the funding for making it happen. Published faircoin 2 new white paper version, with all the details related to the current implementation ! !